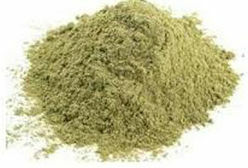 Aloe Vera Powder is made from the Aloe Vera leaves after gel and soft tissues are removed. This product can be used to make juice. One to Three times a day. For each usage, 2-3 grams can be used with water. However, it is NOT suitable for pregnant women and women with period coming. Important information: Our Aloe Vera powder has not been dermatologically tested. Although some people use Aloe Vera Powder as ingredient for skin care; we would recommend users to do allergenic testing before they start using it.